Our activities include design, manufacturing, installation, repairs and preventive maintenance of window cleaning equipment. - We offer annual maintenance of BMU i.e monthly visit for inspection , testing , commissioning of the equipment. - We will inspect & service/repaire your equipment to ensure safe operating condition for every use. - Traction Hoist is a motorised hoist with a wire rope which passes completely through the machine. 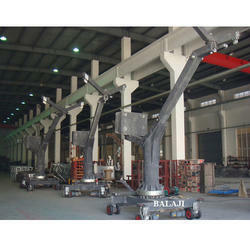 - Traction Hoist has been specially designed for man riding applications. suspended platform or cradle or gundola is a facade access system.